"From Components to Systems" is the motto of isel Germany AG. It represents the company's history: in its early years, isel Germany mainly manufactured individual mechanical and electronic components for printed circuit boards. Today, isel Germany is a manufacturer of special machines whose portfolio includes computer-controlled CNC machines and robot systems for the production of chips. One of its major innovations is RoboGolfPro, a robot that supports golfers in learning the right swing. For many years, proALPHA has supported the isel group in increasing its delivery reliability, optimizing inventory control and creating a central data pool anyone in the company can access. Its wide variety of products has made isel Germany one of the top three manufacturers in the industry. This comprehensive portfolio places special demands on an ERP system: both make-to-order production and series production have to be mapped. Andreas Trabert, Head of Sales at isel Germany, sees this combination of various production types in proALPHA as a major advantage, for example in isel's new business segment Linear Motors. If a customer orders a tailor-made motor, the product is first engineered and then a model is built. If this prototype is approved by the customer, the motor is released for series production. All documents created during make-to-order production can be used again, such as bills of materials. In addition to electronic and mechanical components as well as software solutions and systems in the field of CNC machines and robotics, isel Germany has also started to manufacture display and lifestyle products, such as trade fair stands and fitness and wellness systems. The processes required to manufacture these new products can also be effortlessly mapped in proALPHA. "Since we established a multi-site planning system with the help of proALPHA, our delivery reliability has increased from 75 to 92 percent." Since it was introduced with the last software upgrade, multi-site planning has boosted isel Germany's productivity. The core component of the proALPHA Production Planning module is APS (Advanced Planning and Scheduling). It allows resource utilization to be automatically optimized in real time according to managerial target functions such as delivery reliability, minimum cycle times, and reduced stock. 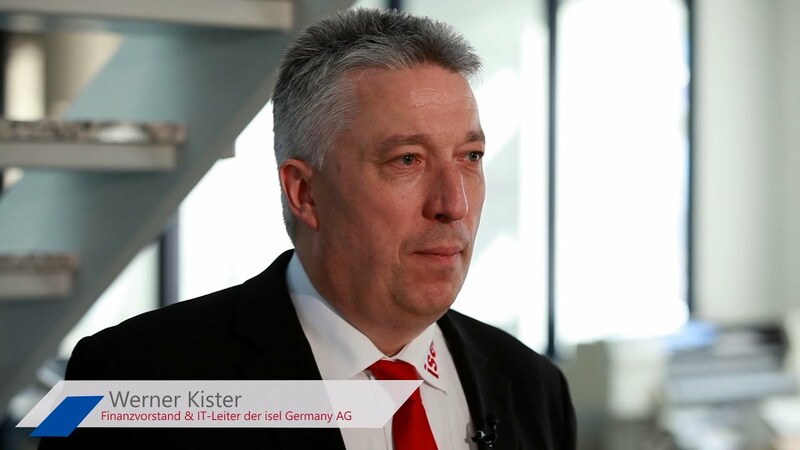 "Since we established a multi-resource planning system, our delivery reliability has increased from 75 to 92 percent," says Werner Kister, Commercial Director of isel Germany AG. In the past, each production unit took care of planning itself, which made it hard to stay on top of things. Today, proALPHA issues warnings if goods cannot be delivered on the confirmed date so that corresponding notifications can be sent to the purchasers of isel products early on. "This has significantly increased customer satisfaction," says Andreas Trabert. All of isel's sites in Germany and its foreign subsidiaries have been connected to proALPHA. This is possible thanks to the Integration Workbench (INWB), which allows any external system to be connected effortlessly. "It enables us to exchange data really fast," says Werner Kister. All subsidiaries draw on the same database. "This boosted our productivity," says Andreas Trabert. Moreover, the proALPHA Intercompany module promotes automated business processes between the group's individual companies. isel Germany has equipped more than 110 workstations with proALPHA and uses almost all software modules. proALPHA WorkflowManagement plays an important role in daily business. It is a versatile tool for mapping business processes and automating them based on rules. For example, when a customer sends a request for quote to the sales department, a quote is automatically generated by means of quotation costing. At the same time, a dummy number is created in sales. The quote is then automatically forwarded to the engineering department, where a customized product is designed. If this product is approved and ordered by the customer, the dummy number stored in the order management system becomes the new product number. Tasks are automatically assigned to the individual departments, too: engineering has to create a bill of materials based on the information stored in the system, production has to define manufacturing processes, and purchasing has to enter customer-specific data. Once the order has been released, manufacture can start. proALPHA has not only added to versatility in production and helped increase delivery reliability but also optimized inventory control throughout the isel group. "With inventory control being mapped in the ERP system and each goods movement at our production sites being tracked, we hardly detect any discrepancies at the end of the year," says Werner Kister. isel Germany is preparing to upgrade to proALPHA version 6.1, which is to be completed in summer 2015. There has already been a test migration, and key users have received training by the proALPHA Academy. "The new version not only has a great look and feel, it also enables us to work more efficiently," says Andreas Trabert. Several customizations that had to be made for isel Germany in the past are now contained in the proALPHA standard version, which reduces implementation effort. isel Germany plans to introduce more functionalities with the upgrade, such as a CAD connection via the CA-Link module. This allows engineers to access data stored in the ERP system, such as assemblies, drawings and purchase prices, from within their CAD environment. The company also considers implementing the E-Business module, complete with a web shop for spare parts. isel customers would be able to place orders online 24-7. A large showroom for the new lifestyle products will be opened in Berlin soon. To connect electronic cash points with proALPHA, a project has been kicked off with the corresponding provider.